“Do not over-vote. If you vote for more than the number of slots (at stake), the votes for this position will be considered as stray votes so they will not be counted,” Comelec spokesman James Jimenez said. MANILA, Philippines — With barely two months left before the May 13 midterm polls, the Commission on Elections (Comelec) has issued some reminders to voters, including not to over-vote. According to Comelec spokesman James Jimenez, only 12 seats for senators and one for party-list group are at stake in the coming elections. For local elections, voters will get to vote for one governor, one vice governor, members of the Sangguniang Panlalawigan, one mayor, one vice mayor and members of the city or municipal council. “Do not over-vote. If you vote for more than the number of slots (at stake), the votes for this position will be considered as stray votes so they will not be counted,” he said. Jimenez noted there is no problem if, for instance, a voter decides to under-vote or to vote for less than 12 senators. Abstain, meaning you did not vote for anyone, is also allowed. 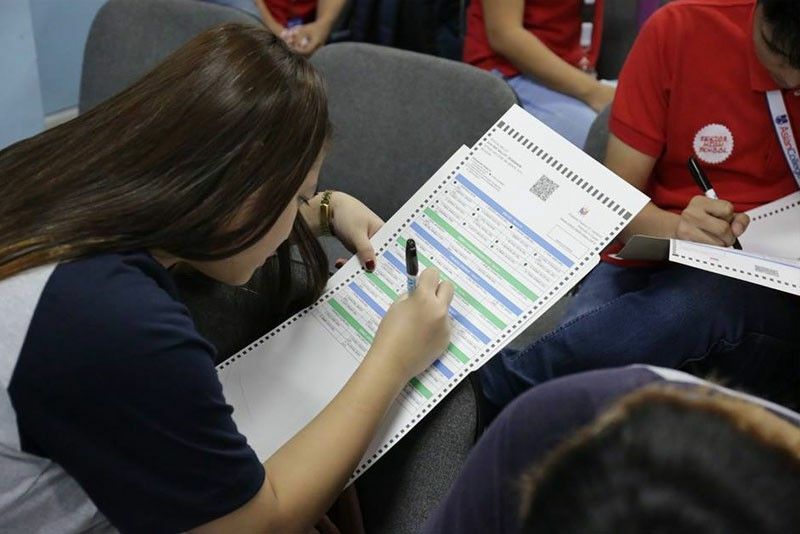 The Comelec also advised voters to shade 100 percent of the ovals corresponding to their candidates, although the vote counting machines are programmed to accept even 25 percent shading. He added it is prohibited to take “selfies” or pictures of the ballots that have been filled out. Data show there are 63 million voters registered for the coming polls. Meanwhile, re-electionist Sen. Sonny Angara is urging the government to put in place measures that would create more jobs and increase productivity in the agriculture sector to encourage young people to venture into farming. Angara issued the statement after the National Economic and Development Authority (NEDA), citing the results of the January 2019 Labor Force Survey conducted by the Philippine Statistics Authority (PSA), reported that the agriculture sector suffered 1.7 million job losses, which primarily contributed to the decline in the actual number of employed Filipinos in January this year compared to the same period last year. The survey showed that total registered employment decreased by 0.9 percent to 41.1 million in January, or equivalent to 387,000 fewer workers, compared to the previous year. NEDA said this was mainly due to the 1.7 million employment loss in the agriculture sector, which overshadowed the combined 1.3 million additional jobs in industry and services sectors. The country’s labor force is comprised of those 15 years old and above, whether employed or unemployed. Angara said the lack of support services from the government to farmers has led to the poor state of agriculture in the country, which makes the industry unappealing to pursue as a career. To boost the agriculture sector, Angara said the government should strengthen support services for farmers by providing better irrigation facilities, institutional credit, proper marketing facilities and other farm subsidies needed to increase their productivity. Opposition Otso Diretso senatorial candidates Chel Diokno, Erin Tañada, Florin Hilbay and Samira Gutoc said effective police work, due process and effective implementation of the court processes are the best solutions to criminal cases and deterrent to crimes. Hilbay said the order of the court to release the suspect in the gruesome murder of 16-year-old Christine Silawan in Cebu, on the ground that his arrest did not follow the correct procedure, was a reflection of a big problem on how law enforcers only look at the end of justice and not the process. Diokno said for any case to prosper, the handling of physical evidence is crucial.